Once Maō has appeared at the top of the maze, four Blinky Clones (based on a character from Pac-Man, 1980) shall appear in the corners; Maō initially attacks by summoning Crystal Rods (based on an admittedly heroic character from The Tower of Druaga, 1984) in preset positions round the maze and making them firing a stream of laser beams (he does not move while doing this, but you shall have to stand in a place where the beams cannot hit you), then firing sparks that run through the maze and disappear after a few seconds. 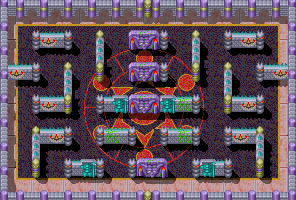 Every time you kill a Blinky Clone, another one will be generated in one of the corners to take his place - and once you have drained all Maō's energy in his initial demonic form both of you shall receive 10000 points for every second you have remaining as the timer resets and he transforms into an evil, black-and-purple version of Pitt, with a one-eyed black Tinker Ball. Once you've drained all Maō's energy in this form, both of you will receive 10000 more points for every second you have remaining as the timer resets again, all Blinky Clones currently upon screen disappear, and he transforms into an enormous one-eyed bat; he will now attack by shooting flames (which will momentarily set the parts of the ground they land on alight) and seven shurikens from his tail. 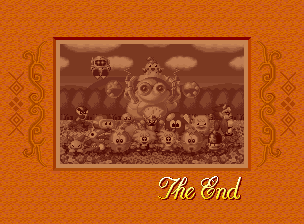 Once you have drained all his energy in this form, he will explode and degenerate (much like Naka-G1 did when you defeated it on Stage 23) - and Pitt and Patti shall then do a somersault as their Tinker Balls jump across the maze to them and the text "GREAT CLEAR!!" appears on the screen, and they receive 10000 more points for every second they have remaining. They will both then receive an "All Clear Bonus": the Life Bonus is 10000 points for every life remaining up to a maximum of 100000, while the Time Bonus starts at 100000, and decreases by 4000 for every seven minutes played, the Treasure Bonus is 1000 points for every perfect area (all eight large Bonus Targets have to be collected in every stage of one world up to a maximum of 8000), and the Pursuit Bonus starts at 46000 and decreases by 1000 for every enemy that they had let degenerate at the end of a stage; you may now sit back and enjoy the game's ending sequence. Once you have entered your initials, the text "GAME OVER" shall appear on the screen and the ranking of your chosen mode's high-score table (singles or doubles) shall then scroll up the screen; for every perfect area (all eight large Bonus Targets collected in every stage of one world), there shall be one apple below your (combined if you were playing in doubles mode) score (up to a maximum of eight). Afterwards, the game will go back into attract mode. This page was last edited on 27 November 2014, at 19:00.